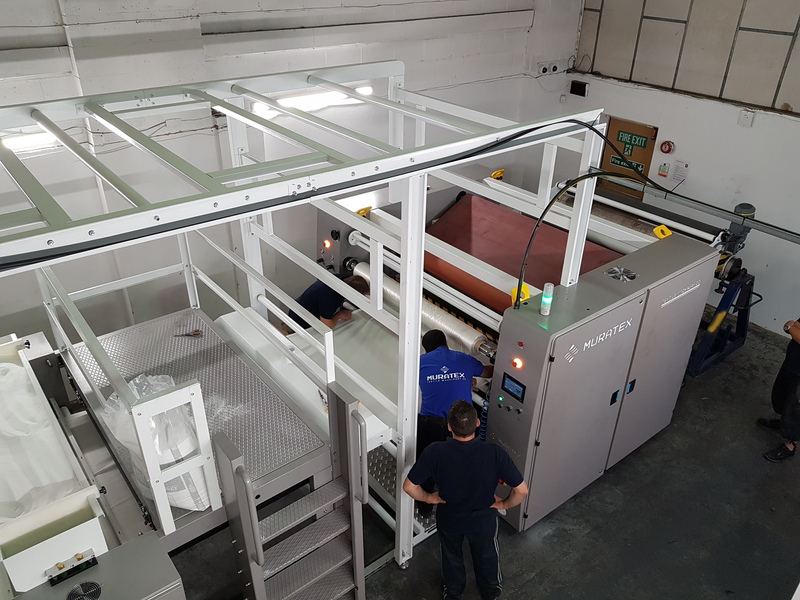 Our powder scattering machines use specifically designed applicator roller surfaces to ensure a regular scattering of any commercially available thermoplastic adhesive powder (approx. 80-500micron). The required amount of powder adhesive can easily be set and this setting can then be synchronized with the speed of the production line. Through careful use of varying amounts of powder, from just a few g/m2 for cost-effective lamination, or higher amounts for full surface coating, the resultant effects required by our clients can easily be achieved. 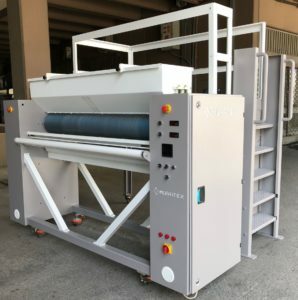 This is all possible with the use of the same application roller, irrespective of the polymer type used; EVA, PE, PA, PES, TPU, etc., and can be achieved on web widths of up to or greater than 5 metres. An oscillating brush with stainless steel needles is used to ensure complete removal of the powder from the rotating applicator roller. The required working width can be adjusted to be step-less and even asymmetric, if required, over the complete web width. A collection bin underneath the scattering device is used to gather any residual powder so that it can be reused, thereby avoiding waste. 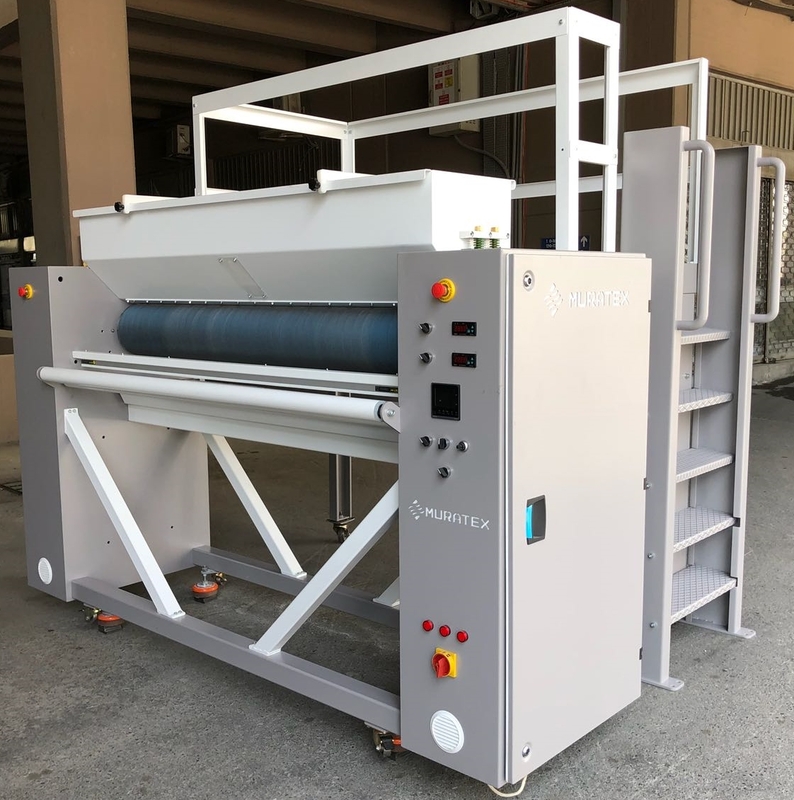 With minimal maintenance in mind, the powder scattering units are designed with readily available access to the oscillating brush and roller, meaning very little production downtime. An automatic powder scattering supply unit is available as an option, to be used in conjunction with the powder applicator. Powder supply suction hose for connection to the thermoplastic storage vessel, big bag or container. Alternatively, a feeding system based on a spiral design can be offered. After even scattering of the powder, it is important to ensure that it stays in the correct areas over the surface of the web. In cases where the substrate surface is not able to maintain the powder in place, a compact Infra-Red (IR) section can be incorporated to sinter the powder to the surface. The amount of power used to ensure the desired effect can be adjusted, to ensure that there is no damage to or uncontrolled shrinkage of the substrate. For powders with a high melting point (i.e. PEEK or PPS for composite applications), an IR oven may be required. Our systems offer custom built Infra-Red ovens solutions to achieve this. The oven can be configured with several sections, with each one having independent control, so that can they can be set at specific temperatures over the length of the oven, with the ability to shut-off over the width of the web to ensure the best possible heat application and to achieve the most efficient use of energy. The bonding is performed by a two-roller nip with adjustable pressure and cooled/Teflon covered squeezing roller. 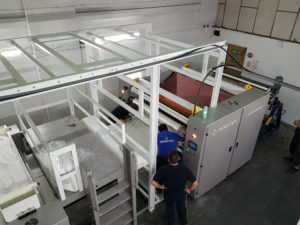 Powder Lamination Line A complete lamination line, consisting of A-frame feeding and winding system, powder scattering unit, IR dryer, 800mm Teflon-coated drum and silicone-coated belt incorporated within the Lamination machine.